The Messelasturidae include two named species, Tynskya eocaena Mayr, 2000 from the Green River Formation and Messelastur gratulator Peters, 1994 from Messel. The former is represented by a single skeleton, whereas of M. gratulator an incomplete skeleton and two skulls were identified (Peters 1994; Mayr 2000f, 2005i). M. gratulator was tentatively assigned to the Accipitridae in the original description (Peters 1994). The phylogenetic affinities of T. eocaena were considered uncertain (Mayr 2000f), but comparisons were made with raptorial birds and the Halcyornithidae ("Pseudasturidae"). A close relationship between Tynskya and Messelastur was assumed by Mayr (2005i), who established the taxon Messelasturidae for a clade including these birds. Three-dimensionally preserved bones of multiple individuals of as yet unde-scribed, Tynskya-like species were collected by Michael Daniels in the London Clay of Walton-on-the-Naze, where they are among the more common avian remains. These birds are listed as owls in Feduccia (1999, Table 4.1; see also Mayr 2000f). M. gratulator and the slightly smaller T. eocaena were about the size of the extant Scops-owl, Otus scops. Both species are similar in skeletal morphology, although the preservation of the fossil specimens prevents close osteological comparisons. Messelastur and Tynskya share the lack of pneumatic foramina in the pneumotricipital fossa of the humerus and a widely U-shaped furcula. The mandibular rami of M. gratulator are very deep. The foot of Messelastur is unknown, but the tarsometatarsus of T. eocaena exhibits a characteristic derived morphology (Mayr 2000f). The trochlea for the fourth toe is much shorter than that for the second and bears a plantarly projecting, wing-like flange, indicating the presence of at least facultatively zygodactyl feet. As in the Quercypsittidae, the ungual phalanges of the feet are owl-like. 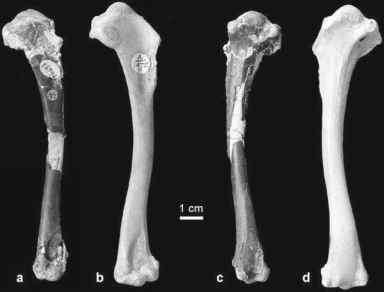 M. gratulator agrees with owls in the absence of a supratendinal bridge on the distal tibiotarsus (Mayr 2005i); however, if it is not an artifact of preservation or preparation, this feature seems to be an apomorphy of Messelastur, as the Tynskya-like London Clay specimens exhibit a supratendinal bridge (personal observation). The skull of Messelastur has large, caudally projecting supraorbital processes, similar to those found in extant Accipitridae and Falconidae. The presence of this feature cannot be established in the poorly preserved skull of the holotype of T. eocaena. A cladistic analysis supported a sister group relationship between the Messelasturidae and strigiform birds (Mayr 2005i), but the results of this analysis were only weakly supported. As evidenced by the specimens in the Daniels collection, one of the two presumptive synapomorphies is absent in Tynskya (the lack of a supratendinal bridge), and the other is also present in the Halcyornithidae (the presence of a plantarly directed wing-like flange on the trochlea for the fourth toe). After recently having had the opportunity to examine in detail the London Clay fossils in the Daniels collection, I am now convinced that messelasturids are close relatives of the Halcyornithidae, and thus most likely stem group Psittaciformes. In both messelasturids and halcyornithids, there are no pneumatic openings in the pneumotricipital fossa of the humerus, the tarsometatarsal troch-lea for the second toe is very small, the coracoid exhibits a foramen for the supra-coracoideus nerve, and the skull bears large supraorbital processes. A major difference between the Messelasturidae and the Halcyornithidae concerns the morphology of the hypotarsus, which bears a single wide furrow in the former but two narrower ones in the latter. Likewise, the beak is shorter and more raptor-like in the Messelasturidae.